Alignment by its basic definition is making something even. Your car’s alignment needs fine tuning periodically and sometimes is needed after an accident. It’s ideal to have your cars’ alignment fairly soon after replacing your tires. What it does, it extends the life of your tires and creates a more pleasant ride and steering experience. Our technicians are highly qualified to determine exactly what is causing the alignment to be off register. We look at more than just he camber, toe and castor settings in order to determine and resolve your alignment issues. Ideally, you should have your alignment checked twice per year. What gives the driver control over their vehicle is the suspension system. As your wheel moves it encounters smoothness and bumps in the road. 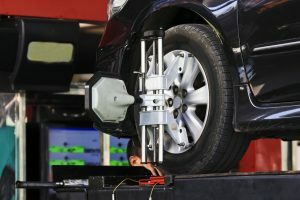 A properly set suspension will not only protect your cars’ frame from the force or shock of the bumps, but also will provide a less bumpy experience for passengers with the added measure of safer handling for example, as when a car transfers its weight when making turns or maneuvering rough roads. Keep your vehicle on the straight and narrow, vehicle alignment helps provide optimal handling, tire longevity and passenger comfort as well as good gas mileage. AutoImports of Denver uses an alignment machine to check your vehicle’s current alignment and as necessary, makes adjustments to return your vehicle to the correct specifications. These wheel angle measurements show whether your wheels are within the alignment settings specified by your vehicle’s manufacturer. AutoImports of Denver technicians provide you with a written evaluation of the results and recommend service based on your manufacturer’s specifications. Wheel alignment consists of adjusting the angle of the wheels to the manufacturer’s specifications. The purpose of these adjustments is to reduce tire wear, ensure straight vehicle tracking and meet manufacturer’s handling specifications. Camber – Is the measure in degrees of the difference between a wheel’s vertical alignment perpendicular to the surface. Caster – The angle created by the steering pivot point from the font to back of the vehicle. Toe – Represents the angle derived from pointing the tires inward or outward from a top-down view.